Chameleons are small reptiles best known for their bulging, rotating eyes and ability to change color. They can make fun and fascinating pets for the right person. Before you bring one of these animals into your life, it’s important you understand some of the health issues they face. They are susceptible to a variety of bacterial, fungal, viral and parasitic infections. By remaining alert to signs of these conditions, you are more likely to catch a disease while it’s curable. Also called rickets, Metabolic Bone Disease (MBD) is the most common disease found in chameleons. It is a degenerative disease that erodes the chameleon’s bone structure until it can no longer support the animal’s body. MBD is caused by an imbalance of calcium and phosphorous or a lack of unfiltered sunlight. (Regular glass filters out the ultraviolet rays that help the chameleon absorb vitamin D3.) If not treated, the condition becomes progressively worse and your chameleon will die--after much suffering. The best treatment is prevention. You need to feed your chameleon gut-loaded crickets, which are crickets that have been fed calcium and other nutrients. The crickets should also be sprinkled with a calcium supplement, which you can pick up at your local exotic pet store. Also, if your chameleon doesn’t get daily natural unfiltered sunlight, you can replace the regular glass in his container with full-spectrum glass, which does not filter out the ultraviolet rays. You can also buy an appropriate ultraviolet bulb at your pet store. If caught early, your veterinarian can treat MBD and give your chameleon a long and healthy life. 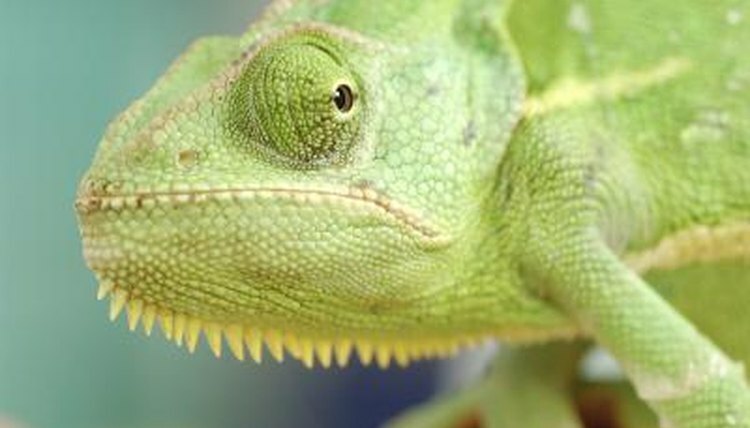 Your chameleon can play host to a variety of internal parasites. Intestinal parasites such as roundworms, protozoa and flukes can weaken his immune system. Your veterinarian can check for parasites and treat the chameleon appropriately. However, the treatment can be hard on these little guys, so make sure you get him checked by a reputable veterinarian familiar with reptiles. Your chameleon can also have parasites in his blood. These hemoparasites are chronically debilitating for chameleons. Your vet can easily screen for and provide treatment for these parasites. These lizards can easily dehydrate if they don’t have a constant source of fresh water. Although dehydration isn’t a disease, it can lead to kidney failure, gout, and death. If your chameleon has sunken eyes, dry flakey skin and is lethargic and not eating, he’s likely dehydrated. With a little water, he should bounce back. Chameleons can also suffer from respiratory infections, usually due to extreme temperature fluctuations. They are also prone to mouth injuries which can lead to mouthrot, a bacterial infection of the mouth. They are also susceptible to many types of viral and fungal diseases. The best treatment for any of these conditions is prevention. With proper environment, proper diet, and frequent cleaning of his enclosure, you can reduce the occurrence of disease in your chameleon. One of the biggest causes of disease is stress. Make sure your chameleon is kept away from high-traffic areas and out of sight of other animals. Also, avoid over handling your friend until he’s totally comfortable with you. Will Bearded Dragons Survive if the UV Light Broke? Why Is My Snake Making Sneezing Noises? On Average, How Long Do Chameleons Live? How to Calm a Chameleon if It Is Hissing? What Type of Fruit Do Chameleons Eat? What Kinds of Fruit Do Geckos Eat? How Many Hours of UVB for a Sulcata Tortoise? How Often Should I Dust Crickets for My Bearded Dragons?